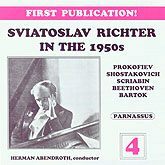 This set was recorded at Moscow recitals in 1954 and 1956. the obvious highlight of this set is a 1954 performance of Beethoven’s Third Piano concerto conducted by Herman Abendroth, during a visit to Moscow. It was Richter’s only performance with Abendroth, and it crackles with intensity. The other material is Prokofiev’s Sonatas Nos. 6 and 9 and Gavotte from Cinderella, eight of Shostakovich’s Preludes and Fugues (the largest group Richter ever played at one recital), Bartók’s 15 Hungarian Peasant Songs,, and Scriabin’s Vers La flamme and Poème. All of the recordings are previously unpublished.